Yup, we want to make sure you have some FUN this summer and we want it to be free, so we are GIVING AWAY three copies of our newest book JUST 4 FUN. 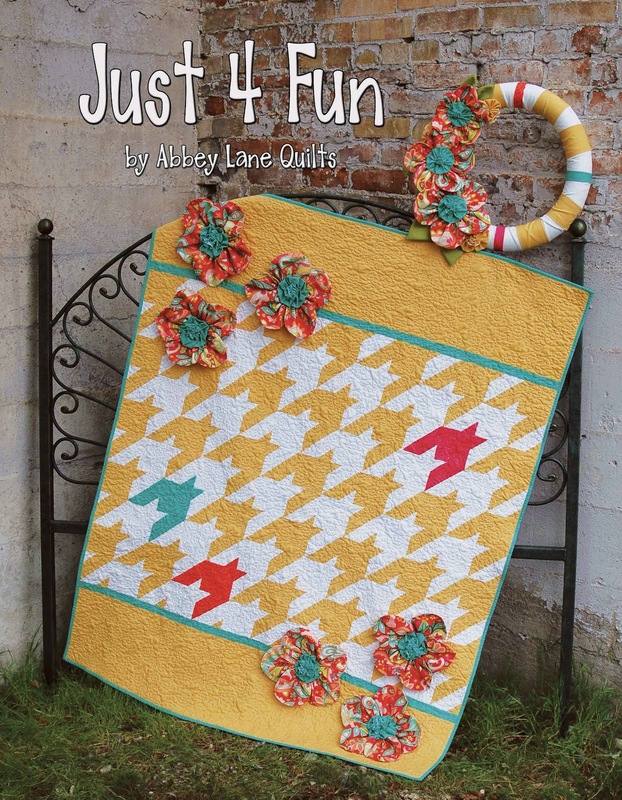 This book has four FUN quilts celebrating spring, summer, Halloween and Christmas. They encorporate FUN modern geometric designs with a FUN retro touch. 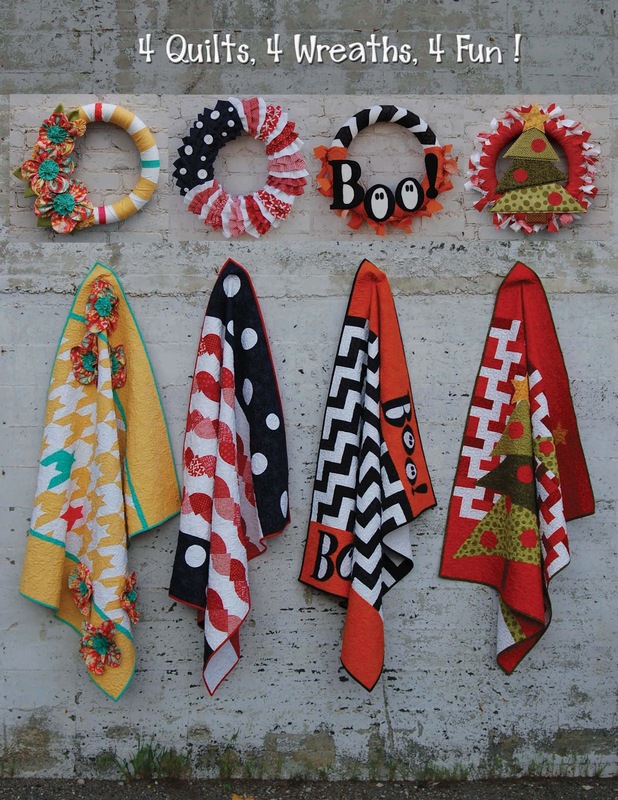 Each quilt has a matching fabric wreath so you can add even more FUN to your home. 2. Head over to the website, http://www.abbeylanequilts.com/, go to the shop page, click on JUST 4 FUN and pick your favorite quilt and wreath. 3. If you have a blog, give our little giveaway a shout out. That's it. You get a point for each of the three, so triple your odds. Here is a peak at one of the pages you will find in the book, it is JUST FOUR THE POP. The projects in the book are FUN, quick and easy, so you can have this one ready just in time for the Fourth of July. Have a FUN week, and thanks for stopping by. We will announce the winners next Monday, so spread the word. It is all about the FUN. I'm a follower! Love this book! Just for the smiles is my favorite new design. I'm already a follower! Thanks! I love Just 4 the Pop the best. Love the black, white and red! Thanks for the chance to win a copy of your book. already a follower - love these ideas! Love Just 4 the Smiles!!!! Cute projects! My favorites are the spring wreath and the Christmas quilt. Thanks for the chance to win! And my favorite is the 4th of July. I want to make this for my son who is a Marine. Love them all. Thank you so much for this giveaway! I like them all, but the herringbone is my favorite. I'm a follower which sure sounds better than being a stalker right! LIKE 'JUST FOR THE JOY'! Really like just For The Joy, thanks. Love the Americana one since Fourth of July coming up! I like 'Just 4 the smiles' best! 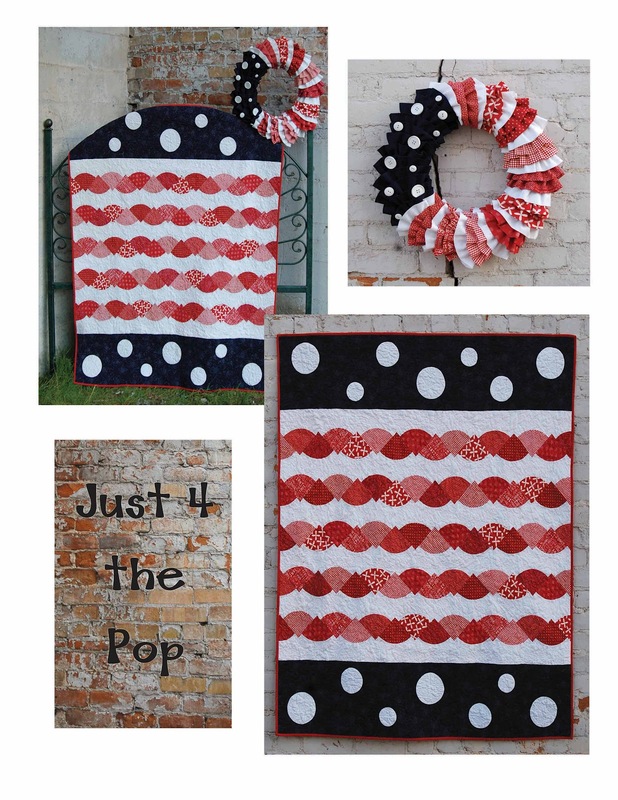 Just 4 the Smiles is my favorite quilt/wreath combo. Thanks! My favorite wreath and quilt is definitely Just 4 The Pop!! So cute. I already follow you. Love, Love, Love the projects I see so far. Can't wait to see the book. I love the quilts in this book! My favorite is the Halloween 'boo' quilt! I am a follower. I love your blog. I love Just 4 the Smiles but I know that the first one I would have to make is Just 4 the Squeals, as my son loves Halloween - even though we don't celebrate it here. I love the boo wreath. I am a follower! Love your designs!! I follow!!! and LOVE it! My fave is the Spring (houndstooth). How fun is THAT pattern! Absolute faverite is Just for the Squeals!! Our family loves Halloween and decorating tor it. This would fit right in. Shared as well!! Thanks for the opportunity! I'm a new follower, don't know why I wasn't already!! I like Just 4 the Joy best! I like Just 4 the Smiles! What great fun. I love Just 4 Smiles - it is so pretty. They are all cute, but the "Boo" is the most fun! I'd, love to go into the draw! I'd have to say The christmas one "Just for the Joy" I am now a follower. I'm a Follower in GFC, but read thru GReader. I liked Just for the Pop best. Must be the circles. I like Just 4 the Pop best! I follow. thanks for a chance to win some fun!